ACL: Congratulations on the release of Dissonance. I’ve been listening to the album for over a month, and I am amazed at its complexity. I’m still hearing new layers each time, especially in the opening piece. According to the track description, you’ve used the viola de gamba to “explode a single moment from Mozart’s 1785 “Dissonance” string quartet.” And yet, it doesn’t come across as the extension of a moment; it has the impact of an extended movement, with a defined trajectory and dense finale. Can you tell us more about this process and why you chose this specific moment to deconstruct and reconstruct? Valgeir: The process started with the discovery of this Mozart string-quartet, and particularly the opening which is unlike anything else he wrote. I learned about it from Daniel Bjarnason when we were teaching a seminar together at a castle in Denmark. One evening we decide to make a pop-quiz for the students and one of the questions that Daniel came up with was “who is the composer of this piece” and then we played them the opening movement of String Quartet K.465 which at the time I don’t think I had heard. If I had I was certainly not paying attention. But I immediately wanted to inhabit it, somehow. A few weeks later I was in the studio with another friend and close collaborator, Liam Byrne. I told him about the idea and he got as excited as I did, and about 72 hours later we had taken the original score, exploded the parts and slowed down to just a fraction of the original tempo and recorded a number of layers of viola da gamba, which Liam painstaikingly played following the score’s notes pretty accurately, but articulating in new ways. Where a quick sixteenth-note became several measures long it opened up room to do a lot within each single note. What followed was just me trying to shape and make sense of all this material and effectively living inside it until I felt it had fermented properly. ACL: Despite its title, the opening piece seems less dissonant each time it is played. Do you feel that frequent exposure to “difficult” music changes the listener’s notion of what is difficult? How have your own listening preferences developed over time? Valgeir: It can be like tasting Campari or oysters for the first time. Many people might have a knee-jerk reaction and shudder or spit it out, but then gradually discover depth and richness in the taste and texture. You begin to sense the harmony and noise that on first listen can seem impossible to navigate, and start hearing further and deeper into it. I don’t try to make “difficult music” but I do like to push my own perception of sound and I hope to push someone else’s perception as a result I like doing that by combining source material that appears to be at opposite ends of the spectrum. Acoustic and electronic for example, or very loud against very quiet. Ultimately I want the in listener in the dead centre of the room to be immersed in sound but still also be able to hear into the furthers corner of the space. ACL: Although the album is divided into three parts, it would be easy to interpret these as two. The second and third compositions seem much more consonant, creating what I would call a welcome friction between halves. Was this your intention, and if so, what factored into your decision to move from dissonant to consonant? Valgeir: Even though it wasn’t my intention when I wrote the music, it became very clear to me when I started putting the album together that I wanted these 2 halves to juxtapose and form a whole. And what you are saying might again have to do with perception, at least partly. But this is exactly what Mozart’s piece plays with so brilliantly. It builds up these discordant shapes that resolve into moments of pure harmonic sunshine, only to deconstruct and reconstruct them over and again. I wanted to exaggerate this by making it all happen so much slower and in a much wider dynamic. I had decided very early on to call the record Dissonance, but I had sequenced it the other way around so that it would open with the more “consonant” pieces, as you call it, and then the gradient would shift to a more dissonant place on the B-side. Maybe I wanted it to be a bit more digestible, so it was only after I had sent it out to be mastered for vinyl that I eventually followed my gut to flip it around and open with Dissonance. All 3 pieces were created as individual stand-alone works. And what connects No Nights Dark Enough and Eighteen Hundred & Seventy-Five is that they are written for orchestra, with live electronics, while Dissonance is a studio piece where the viola da gamba is layered multiple times, and processed and manipulated to create a “wall of gamba”. ACL: There’s no denying that the world is in trouble at the moment ~ as your press release states, “collapsing under its own internal dissonances.” Iceland has had an astonishing run of political instability over the past decade. The last four years have apparently been tumultuous for you as well. But when I listen to these pieces, I think of Samuel Beckett’s words, “I can’t go on, I’ll go on.” Am I reading too much into the sequencing to interpret the second and third pieces (a melancholic piece written in honor of John Dowland and a dramatic piece inspired by the journey of Icelandic settlers to Canada) as encouragement for those experiencing inner and outer conflict? “1875” seems particularly triumphant in its surges, and the album cover seems to represent a personal movement from dark to light. Valgeir: I think you’re doing well to read that into it. And I won’t try to interpret it for you in any different way. I think that giving people some coordinates as a way into a piece of music or a body of work like this can be helpful, and every detail in this album is certainly loaded with personal meaning, from the notes and sounds to the artwork and imagery. But I don’t want it to be narrowed down to that and only that because I’d like the listener to have his or her own reaction to it. 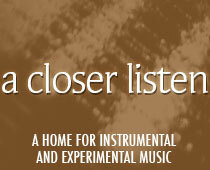 ACL: You’ve produced, engineered and mastered a remarkable number of recordings in recent years (nearly 100! ), written for stage and screen, and toured; you continue to run both a label and a studio, and you seem to breathe music. Which aspect of your career do you enjoy the most? Do you have down time, and if so, how do you use it? Valgeir: Work is omnipresent, and as an artist I don’t particularly want there to be a clear divide between life and work, they should be feeding of and into each other. Working with the right people, in the label and the studio, and for my music making at large is the key for me to remain productive and enable time to do other things too. In music there is always something new to learn and what’s what I enjoy the most, and I like challenging myself and keep pushing new ideas and making new connections. ACL: Seven years have passed since Draumalandið (a film about environmental concerns in Iceland). Are you still active in efforts to preserve natural resources in Iceland, and if so, have you seen progress since the release of the film? What signs of hope do you see in the current generation? Valgeir: I try to do my part to promote awareness, and I’ve had the opportunity to do that through the Dreamland music when it’s performed by orchestras around the world. I worry about the way our government continues to have a short sighted policy when it comes to using our resources. Someone said recently that the only reason we haven’t done greater damage to the nature in Iceland already is that we’d need a bigger population than we have. It’s depressing, because Iceland should have every opportunity to turn that around and to be at the leading edge of solving this global problem. A Closer Listen thanks Valgeir Sigurðsson for his time and generosity. Dissonance is released 21 April on Bedroom Community.